Virgo10's Laughing Place! The Last Of The Cat Pages! 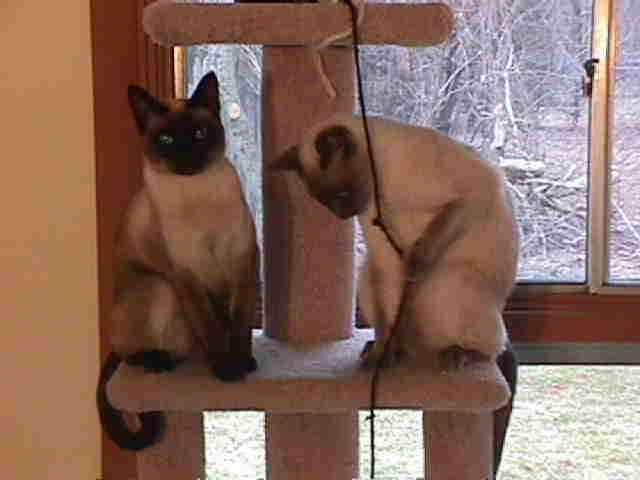 Tessie and Mollie, My Siamese kittens. Tessie and Mollie came to us in July of 1997 when they were 4 months old. I had been in search of a Siamese cat for several months. Finally I saw an ad for one in our local paper. I was only going to go and look. Fortunatly my husband decided to bring our cat carrier, "just in case". 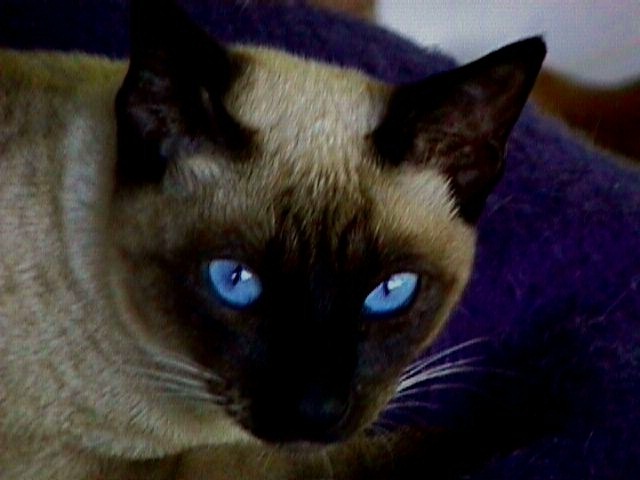 Years ago I had owned a Siamese cat named Kiddle, or perhaps it would be safer to say that she owned me. For many years, from the time I was a teenager through the time I had children of my own, she was my friend. Never judgemental, always loving, she had a sense of humor and was protective of me and my little ones. When she died at the age of 15, I thought my heart would break. Less then 6 months later, I got another Siamese cat that was the total opposite of Kiddle. I had her for less than a year, as it was around that time that I ended up moving to the complex that didn't allow pets. I thought alot about Kiddle and the other Siamese cat as we drove to see this new one that I might adopt. I decided to sit on the floor to see if this cat would choose me! When we arrived, the lady that owned the cats told us that because of a severe allergic reaction she had to give them up. I felt so bad for her. She told us that she had two of them (sisters) and called to them. Down the stairs bounded two tiny balls of fur. At first they stood off in the distance, sizing us up. I sat down on the floor and first Mollie, then Tessie, approached me cautiously. Then, before I knew it, both of them were climbing on me, purring and talking. With tears in my eyes I looked at my husband. He was smiling broadly and told the lady that he guessed we'd be taking them both! All the way home I wondered what the other cats reactions might be. I wasn't too concerned about our two male cats. I thought that Baby would sniff them and then wander off in search of food. And as for the Old Cat, well, I didn't even think he would acknowledge them. My main concern was the female Calico Cat. 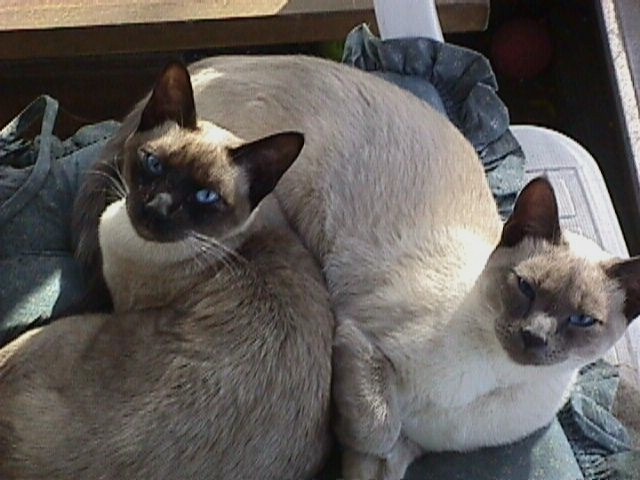 Years ago when I had that other Siamese cat, who was a female, she turned out to be very territorial. At one point, she even attacked a homeless kitten we brought into the house and hurt it so bad that I had to have it put to sleep. But who knows what goes on in the minds of cats? The first cat to make friends was the Old Cat. He found the kitten's antics endlessly entertaining and after only a few days joined in with their play, much to my surprise and theirs! He would wrestle with them, always careful to keep his razor like claws in. However when Mollie, the more daring of the two, thought it might be fun to use him like a pillow during nap time he let her know in no uncertain terms that there were some things that an Old Cat would rather do alone. 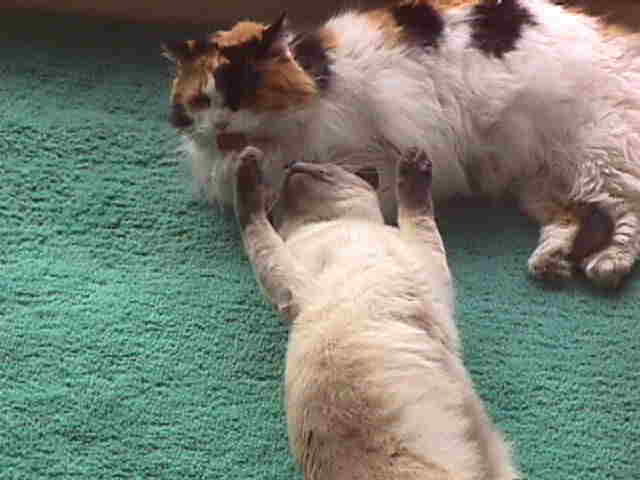 As for the Calico Cat, her mothering instinct took over almost immediatly. After a few days of being her usual shy self she must have decided that these were the babies she'd always dreamed off. Now she plays with them, washes them and, in general, has a great time with them. Alas, we did have one hard sell. Baby, our original cat did not want anything to do with the new kittens or with us. He seemed to get more and more withdrawn. If it's possible, he even looked at us with sad eyes as if to say, why don't you have any time for me? So both my husband and I began to pay extra attention to him, stopping to pet him whenever he was near by. Now he's pretty much back to his old self. Still not wild about these new house guests, but, at least, interacting with them and us again. Here are two exceptional sites for any of you who have loved and lost a pet. But be warned... do not enter unless you have a box of tissues nearby. More Confessions of a Disney World Junkie and Other Disney Info and Fun Stuff!